California joins a growing number of states passing new laws intended to fend off any new offshore oil drilling. On Wednesday, California's Senate and Assembly each passed nearly identical bills, Assembly Bill 1775 and Senate Bill 834. The two bills effectively bans new offshore drilling by prohibiting the State Lands Commission from issuing new leases for oil-related infrastructure in the state's coastal waters. This includes piers, pipelines and wharves needed for oil and gas development. "It will act as a strong deterrent for oil companies, who will be forced to transport oil through Mexico and Canada," says Richard Charter, a senior fellow at the Ocean Foundation. The proposal also bars current leases from being renewed or modified to support new offshore drilling efforts. This could stand in the way of the federal governments proposals to expand coastal oil and gas extraction in California by offering new leases. State-level efforts to thwart federal offshore drilling are a response to the Trump administration’s proposal to open up more than 90 percent of the outer continental shelf to oil and gas exploration. New Jersey passed a comparable bill in April. Delaware, Maryland, New York, Rhode Island and South Carolina are considering similar measures while Florida has placed the issue on the November ballot. Efforts by multiple states to effectively ban offshore drilling are unprecedented, says UC Davis environmental law professor Richard Frank. The last time a major clash between states and the federal government over offshore drilling occurred was during the Reagan administration, when then-Interior Secretary James Watt also attempted to open up much of the continental shelf to offshore drilling. In response to widespread public opposition, Congress ultimately stepped in and blocked the Interior Department from moving forward with its plans. The same philosophical issues and heated rhetoric characterized that debate, with Governor Jerry Brown, who was also governor at the time, blasting Watt as a ''zealot intent on wrecking our coastline." 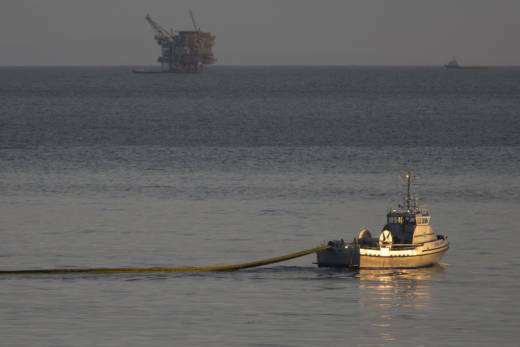 In response to the Reagan Administration's proposal, 24 cities and counties throughout California adopted local ordinances in the late 1980s banning onshore facilities from supporting offshore drilling. Oil companies sued to overturn the ordinances and eventually lost. Charter, who helped craft the local ordinances, says the current proposal being considered by the state legislature would compliment existing local ordinances, and even encourage new ones, by denying oil companies access to both California land and waters. "If you can't build it on state waters and you can't build it on land, you're not going to bother to drill off the California coast," says Charter. Frank says if Congress really wanted to get on a war-footing with defiant states, it could pass a law to override local legislation but that would likely lead to a slew of lengthy lawsuits. "The lands in question here are state sovereign lands. Federal and state courts have acknowledged that states have very broad authority to manage those lands as they see fit," says Frank. Current efforts to ban offshore drilling also benefit from bipartisan support, with many state republican leaders forcefully objecting to the Trump Administration's efforts to open up lands for offshore drilling. "This has never been a partisan issue. It's always been a no-brainer because it's local economies you're protecting," says Charter. California’s coastal economy attracts 400,000 jobs and generates almost $20 billion annually in the fishing, recreation, and tourism sectors, according to the Business Alliance to Protect the Pacific Coast. In what might be an ironic twist, Charter says Trump might turn out to be one of the strongest motivators yet for coastal protection. He even credits Trump with broadening and deepening the conservation ethic nationwide. "I think he may be doing us a favor by awakening a latent public interest in defending our national parks, national monuments, and coasts," says Charter. "In a Machiavellian sort of way, I think Trump is actually helping to develop a stronger environmental ethic in America by threatening everything the public holds dear. " The California legislature is expected to finalize and pass the bills by August.